The PKK announced its decision for a period of “passive defence” from 13 August till 20 September. The constancy of the process is contingent on four conditions. The decision was influenced by the beginning of the moths of Ramadan amongst other factors. With less than a month to go until the referendum, the political winds are getting stronger day by day. For the ?no? camp, Sept. 12 will be the day to cast a sort of vote of confidence for the Justice and Development Party (AK Party) and its leader, Prime Minister Recep Tayyip Erdoğan. Turkey is entering a new period with the Ergenekon investigations, which officially began in June 2007. According to the prosecutors, Ergenekon is an underground terrorist organization which was established to control the country, a ?deep state? that has infiltrated nearly all levels of government, especially the military. Its aim is to incite public chaos and a military coup with the ultimate goal of overthrowing the incumbent Justice and Development Party (AKP). When I called some government figures yesterday to learn their views about the effect the Supreme Military Council (YAŞ) crisis had on the upcoming referendum, I saw that they were relaxed. It wouldn?t be wrong to suggest that the crisis that has surrounded this year?s changing-of-the-guard meeting of military top brass has marked a turning point in forcing the military gradually, if not immediately, back to its barracks, its natural place in a democracy. Statements from Abdullah Öcalan, convicted leader of the outlawed Kurdistan Workers? 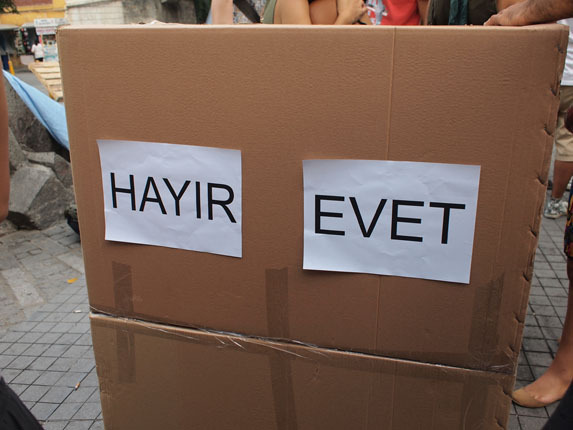 Party, or PKK, on the referendum have been interpreted as him softening his stance on the boycott. Turkey has been experiencing an interesting process of polarization due to the constitutional amendment package and the referendum process. Let me take you back to a simpler age. This was a time when Turkey was a bit like a child on a tricycle peddling furiously straight into traffic. There are claims that the military failed to act against terrorists in Hantepe despite intelligence provided by Herons to 30 security units during every second of a terrorist attack on an outpost in the area in mid-July. The Supreme Military Council (YAŞ) meeting has ended, and the new upper echelon of the Turkish Armed Forces (TSK) has been determined. Those who follow the rallies of Republican People?s Party (CHP) leader Kemal Kılıçdaroğlu against a government-sponsored reform package to be presented in a referendum on Sept. 12 are justly asking what vision he is putting forward, and what original solutions he proposes on significant issues. YAVUZ BAYDAR – The politics of saying ?no? In the past week or so, most of my time was spent trying to understand what lies behind the mindset of those who declared to have already decided on a ?yes? or ?no? vote in the referendum and those who say they will boycott it. The Republican People?s Party (CHP) continues to draw criticism from democratic circles over its opposition to the government-sponsored reforms that will be presented in a referendum on Sept. 12. The PM has claimed that he wants to make Turkey a first-class democracy. But how can this country get there when its politicians fight using second-class methods? With less than a month to go until the referendum, the Kurdistan Workers? Party (PKK) has issued a temporary cease-fire, due to last until Sept. 20. The truce could be reconstructed and lead to a long-lasting silencing of arms if certain conditions are met. The outlawed Kurdistan Workers? Party (PKK), which has increased its attacks over the past several months in the run-up to a referendum in which government-sponsored reforms will be presented to the public, has declared a cease-fire, in effect until Sept. 20, citing the holy month of Ramadan, currently being observed by Muslims.